A group calling itself the California Cannabis Hemp & Health Initiative received clearance from the California Secretary of State Thursday to circulate a petition to legalize pot at the ballot box in the November 2014 election. According to the Secretary of State's Office, the CCHI "Decriminalizes marijuana and hemp use, possession, cultivaton, transportation, or distribution. Requires case-by-case review for persons currently charged with or convicted of nonviolent marijuana offenses, for possible sentence modification, amnesty, or immediate release from prison, jail, parole, or probation. Requires case-by-case review of applications to have records of these charges and convictions erased. Requires Legislature to adopt laws to license and tax commercial marijuana sales. Allows doctors to approve or recommend marijuana for patients, regardless of age. Limits testing for marijuana for employment or insurance purposes. Bars state or local aid to enforcement of federal marijuana laws." The California Legislative Analyst and the state director of finance state that the initiative, if passed, would result in "reduced costs in the low hundreds of millions of dollars annually to state and local governments related to enforcing certain marijuana-related offenses, handling the related criminal cases in the court system, and incarcerating and supervising certain marijuana offenders. Potential net additional tax revenues in the low hundreds of millions of dollars annually related to the production and sale of marijuana and industrial hemp, a portion of which is required to be spent on marijuana-related research and other activities." The proponents for the measure Berton Duzy and Michael Jolson must collect the signatures of 504,760 registered voters — the number equal to 5 percent of the total votes cast for governor in the 2010 gubernatorial election — in order to qualify it for the ballot. The proponents have 150 days to circulate petitions for the measure, meaning the signatures must be collected by February 24, 2014. Virtually anyone can get a ballot initiative cleared for circulation. Professional initiative operators generally use paid signature gatherers — at a cost of millions of dollars — to meet their quota by deadlines, and have in the past said it would be very difficult for an all-volunteer team to do it. Sacramento Michael Jolson has tried and failed in multiple attempts in the past to get pot legalization on the ballot. 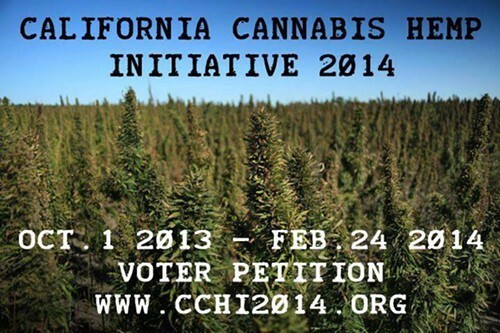 CCHI is taking volunteers to circulate the petition, and looking for donations. A recent poll suggested that 60 percent of registered voters approve of cannabis legalization, though the details of any plan have divided supporters in the past. Best of luck CCHI 2014, you can learn more about the organization here.